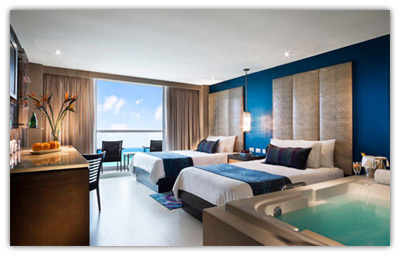 Guest accommodations include 601 luxurious rooms, many with ocean or lagoon views. Rooms come with marble bathroom and glass-enclosed shower, private balcony/terrace, double Jacuzzi, marble flooring, individually controlled air conditioning, satellite TV with premium satellite channels, purified water, coffee makers, alarm clock, in-room safe, direct dial telephones, hair dryers, mini bars containing all types of beverages, turndown service upon request (standard in suites), iron and ironing board, and data ports (in some rooms). Deluxe Rooms – 430 sq. 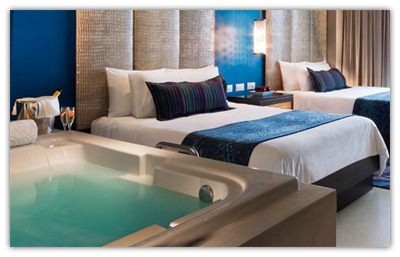 ft. One king or two double beds, in-suite double Jacuzzi; private bath with shower only. Additional amenities include flat screen LCD TV with satellite; complimentary unlimited phone calls to Mexico, Canada and USA (certain restrictions apply); complimentary wireless internet access; in-suite digital laptop-size safe; liquor dispensers containing whiskey, rum, tequila and vodka; mini-bar stocked with sodas, bottled water, juices and domestic beer; bathrobes and slippers; 24 hour room service & turndown service. The views are limited and could be partially obstructed. This category does not include any type of ocean view rooms. Deluxe Gold – 430 sq. ft. One King or two dbl beds. Double Jacuzzi, In Room Wine. Private Bath with shower only. Additional amenities include flat screen LCD TV with satellite; complimentary unlimited phone calls to Mexico, Canada and USA (certain restrictions apply); complimentary wireless internet access; in-suite digital laptop-size safe; liquor dispensers containing whiskey, rum, tequila and vodka; mini-bar stocked with sodas, bottled water, juices and domestic beer; bathrobes and slippers; 24 hour room service & turndown service. These rooms have a sunset view balcony (lagoon view). Deluxe Platinum – 484 sq. ft. One king or two double beds; in-suite double Jacuzzi; private bath with shower; balcony. Additional amenities include flat screen LCD TV with satellite; complimentary unlimited phone calls to Mexico, Canada and USA (certain restrictions apply); complimentary wireless internet access; in-suite digital laptop-size safe; liquor dispensers containing premium brands of whiskey, rum, tequila and vodka; mini-bar stocked with sodas, bottled water, juices and domestic beer; bathrobes and slippers; 24 hour room service & turndown service. These rooms are ocean view. Deluxe Family – 763 sq. ft. Two connecting suites, one with a king size bed and the other with two double beds. Double jacuzzi in the adult’s room. Additional amenities include flat screen LCD TV with satellite; complimentary unlimited phone calls to Mexico, Canada and USA (certain restrictions apply); complimentary wireless internet access; in-suite digital laptop-size safe; liquor dispensers containing whiskey, rum, tequila and vodka; mini-bar stocked with sodas, bottled water, juices and domestic beer; bathrobes and slippers, including sizes for children; kid friendly snacks and bathroom products; Xbox 360 and DVD player with epic games and DVDs available on request; 24 hour room service & turndown service. These rooms have a sunset view balcony (lagoon view). Deluxe Diamond – 430 sq. ft. Adults Only. One king bed. Additional amenities include flat screen LCD TV with satellite; complimentary unlimited phone calls to Mexico, Canada and USA (certain restrictions apply); complimentary wireless internet access; in-suite digital laptop-size safe; liquor dispensers containing premium brands of whiskey, rum, tequila and vodka; mini-bar stocked with sodas, bottled water, juices and domestic beer; bathrobes and slippers; 24 hour room service. Exclusive Concierge amenities; balcony with chairs and table; DVD and CD player; special room service menu; nightly petit fours & nightly turndown service; complimentary beach bag. These rooms have ocean views and are in the best locations. Rock Suite Platinum – 1,065 sq.ft. Two bedroom suite, one with a king size bed and the other with two double beds. Additional amenities include flat screen LCD TV with satellite; complimentary unlimited phone calls to Mexico, Canada and USA (certain restrictions apply); complimentary wireless internet access; in-suite digital laptop-size safe; liquor dispensers containing premium brands of whiskey, rum, tequila and vodka; mini-bar stocked with sodas, bottled water, juices and domestic beer; bathrobes and slippers; 24 hour room service; private terrace, most with lounge chairs; exclusive room service menu; late night pillow menu; aromatherapy; iPod dock; DVD player; CD player; nightly petit fours & turndown service. These suites are ocean or lagoon view. Rock Star Suite – One bedroom suite with King size bed. Additional amenities include flat screen LCD TV with satellite; complimentary unlimited phone calls to Mexico, Canada and USA (certain restrictions apply); complimentary wireless internet access; in-suite digital laptop-size safe; liquor dispensers containing premium brands of whiskey, rum, tequila and vodka; mini-bar stocked with sodas, bottled water, juices and domestic beer; bathrobes and slippers; 24 hour room service. Exclusive Concierge phone service; two 25 minute massages; private check-in/out, late check-out & early check-in (subject to availability); private ocean view terrace; DVD player; exclusive room service menu; nightly turndown service; exclusive complimentary beach bag. These rooms are ocean view.